Our roads and pathways are lit so that we can move safely with good visual comfort. However, when nobody is present, energy is wasted meaninglessly. A new way of lighting solves this paradox: the light bubble. Switching on specific lamps around a user creates such a light bubble. 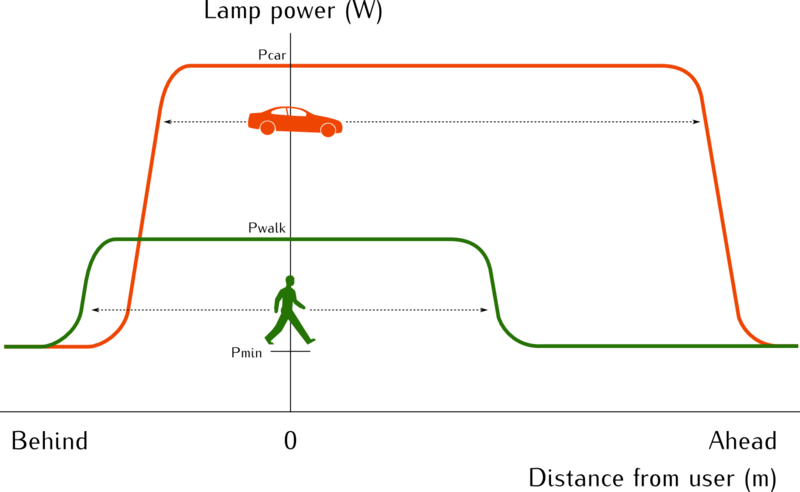 Depending on whether it is a pedestrian, bicycle or vehicle, several parameters are adapted: lighting power, lighting area, symmetry, … Moreover, this bubble moves along with the user so that he will not notice that light varies out of his field of view. This effect is made possible by placing onto each luminary a Smartnodes device. Each one is equipped with sensors, communication means and a micro-computer. Through their continuous communication, they can determine if a user is present and its characteristics. These nodes can then coordinate themselves to implement the light bubble. To create such bubbles, one must first establish if a user is present and, if yes, its precise characteristics: position, speed, nature (pedestrian, bicycle, car),… These results are obtained through complex algorithms. Instead of computing everything on a big, central computer (centralized solution), these algorithms are present on each SmartNodes device. It is through their dialog and communication that they can determine the high-level information they need. No node decides for others what they should do; instead, each is totally autonomous and only share its own knowledge with the others. Such a system is a fully decentralized solution, as the intelligence is spread onto each node. This has many benefits, such as increased robustness and reliability, eased scaling of the installation,… With this architecture, all Achille’s heel are removed: the good working of the whole system does not depend on some specific parts.